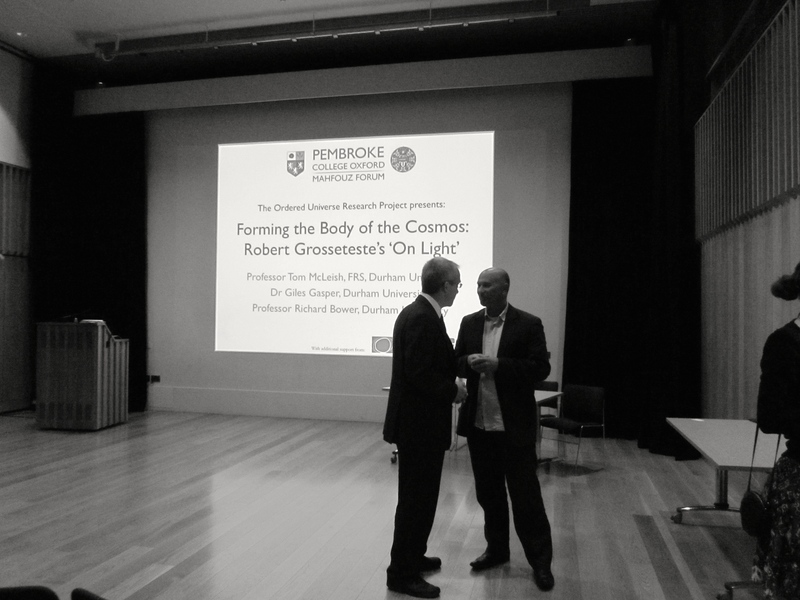 The Mahfouz Forum on Grosseteste’s De generatione sonorum (On the generation of sound) culminated in a set of public lectures held in the Pichette Auditorium of Pembroke College. 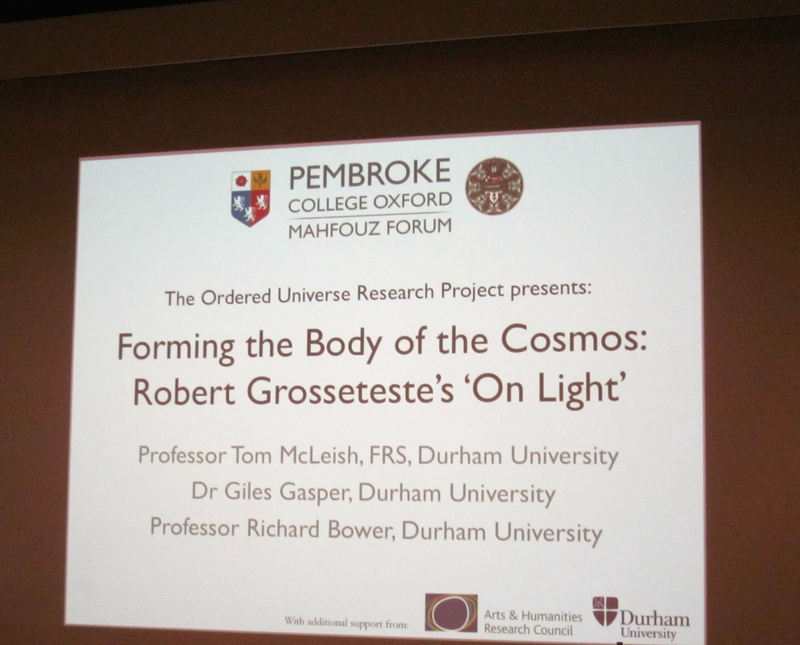 With this having been the third time that I got to enjoy being part of an Ordered Universe gathering, I had heard before some elements of these talks given by Tom McLeish, Giles Gasper, Hannah Smithson and Richard Bower. But far from making the experience repetitive, it has been very inspiring to see how the speakers’ approach and evaluation of the topics has been evolving and expanding. In addition, it’s rewarding to see how my own understanding of the themes has developed from when I first joined, and how some of the concepts I initially couldn’t get my head around by now seem quite familiar. In what follows I’d like to mention some aspects of the talks that I found particularly interesting, but without attempting to give an in any way representative summary of the talks. 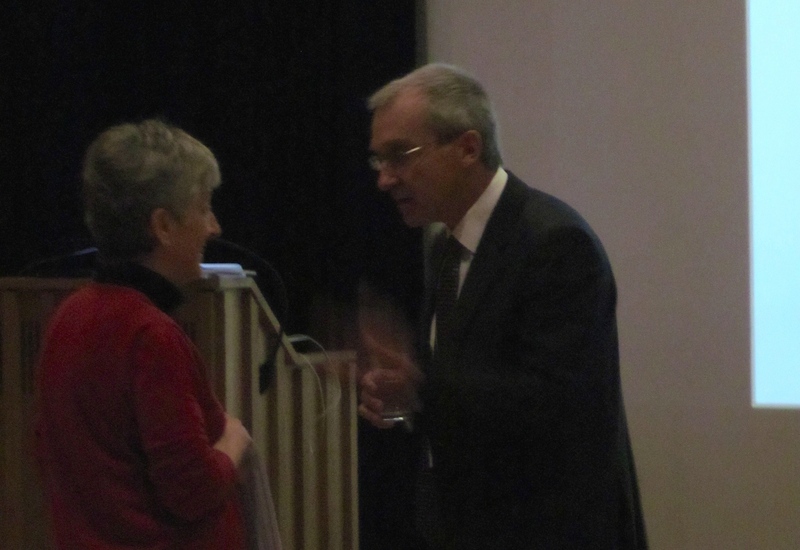 The lectures were opened by the Master of Pembroke College, Dame Lynne Brindley. She dived straight into what the Mahfouz Foundation aims to support: interdisciplinary studies. With interdisciplinarity being the buzz word for current research, she warned that it’s often a ‘much overworked phrase but underdefined concept’. She then went on to point out that the Ordered Universe Project constitutes a refreshing exception in this respect, in that it does more than merely paying lip-service to interdisciplinary commitments. Tom McLeish took up this lead in his introductory talk by stressing that the Ordered Universe group doesn’t engage in interdisciplinary efforts for the sake of its being fashionable, but because this is essential for their being able to achieve the goal they’ve set themselves, namely doing justice to the sophistication of 13th-century science. With this workshop being held in an Oxford College, the interdisciplinary theme was all around. As Lynne Brindley put it, colleges are ‘natural incubators’ of interdisciplinarity as they enable fellows and students from across the disciplines to talk to each other. I cannot stress enough how much this aspect has marked my undergraduate experience at Pembroke. Through the close-knit College community friendship groups span the range of subjects, from history to medicine and from linguistics to music. This diversity enriches discussions and has had an invaluable impact on my appreciation of how questions and approaches differ and resemble each other across the disciplines. A common theme shared by the scientific and historical elaborations that followed is that of Grosseteste’s pursuing an agenda of unification. As Giles Gasper laid out during his fascinating talk, Aristotelian texts entered Western scholarship from 1150 onwards, mostly in the form of translations and added commentaries by Arabic thinkers, such as Avicenna and Averroes. Grosseteste was one of the first to grapple with these Aristotelian and Arabic texts and in doing so, he produced fascinating amalgamations of ancient, Arabic and Christian world views. 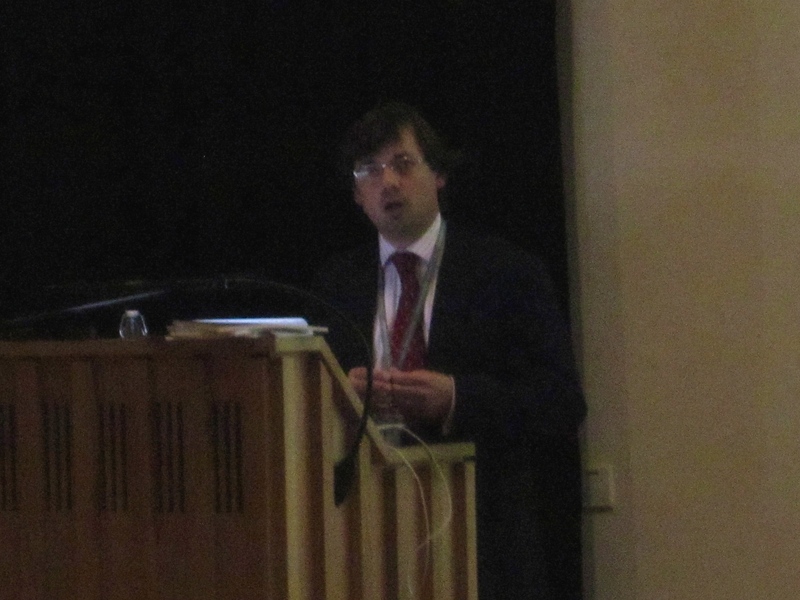 In continuation with the unificatory theme, Richard Bower’s talk focused on the ‘Newtonian leap’ Grosseteste made by drawing inferences from light giving solidity to matter to how this could explain the origin of the entire cosmos (compare Newton’s extrapolation from the force that makes apples fall to the ground to what keeps the moon up in the firmament). Watch this space on how Grosseteste’s unificatory agenda, applied at multiple levels, has affected his account of the nature of sound and his principles of phonetics! 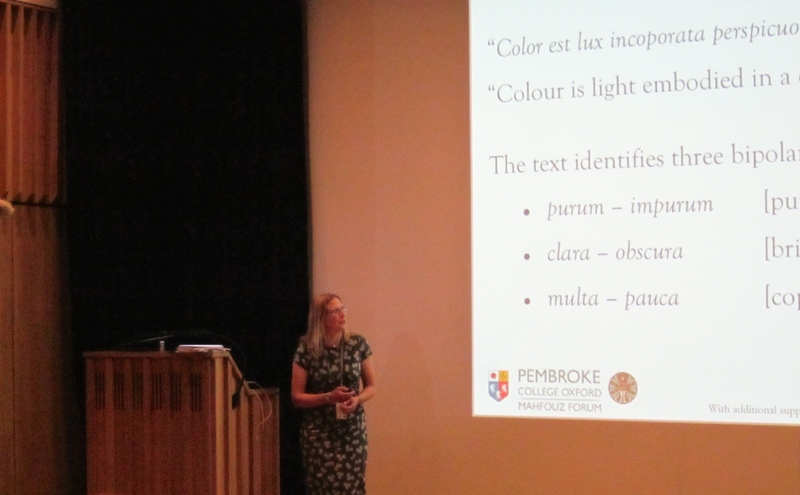 In the second part of the public lectures Hannah Smithson took us through Grosseteste’s models of colour, laid out in his De colore (On colour) and the De iride (On the rainbow). Time and again I’m amazed by how the text that initially seems to make rather cryptic references to seven colours descending from whiteness and seven ascending from blackness, somehow meeting in a middle space, suddenly makes sense when conceptualised in a 3D cubic representation. As Hannah Smithson argued, it doesn’t matter whether Grosseteste thought of this way of visually representing his model: in his text he explicitly counts out seven combinatorics in a 3D space, and all we do is to ‘translate’ this into a representation of his model that makes his account more accessible to modern-day readers. In order to pre-empt commonly made objections, Tom McLeish had already highlighted that this is not a projection of modern science onto 13th-century thoughts but rather a closer examination of the text, thereby for the first time enabling us to give full justice to its complexity and coherence. 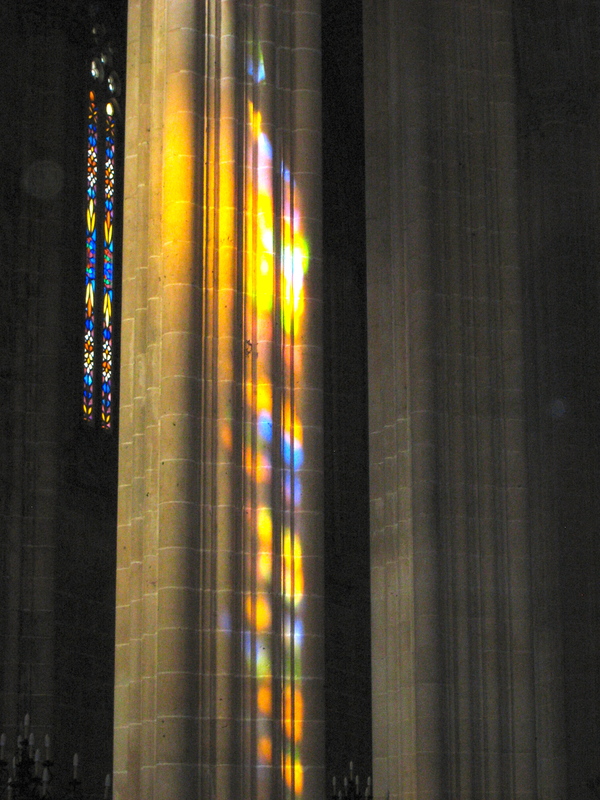 And, most striking and even surprising to the scientific members of the team themselves, through their engagement with Grosseteste’s ideas new science has been generated, a wonderful example of which is the novel way of navigating colour space that Hannah Smithson subsequently introduced us to (see Smithson et al., 2014). Hannah Smithson concluded her inspirational talk with a set of take-home messages, two of which relate to reflections on the history of science. Firstly, ‘transmission of ideas is complex’, which amongst other aspects defeats the conception of history leading up to modern-day scientific practice in a linear fashion. Secondly, ‘when does one way of looking take precedence over another?’ Through meta-level perspectives encouraged by engaging with Grosseteste’s works we realise that future generations are likely to look back onto our models of the natural world in the same way as we’re now looking back onto Grosseteste’s ideas. It’s tempting to dismiss thoughts of past centuries as nonsense, without developing deeper appreciation for the creativity and ingenuity that mark their achievements in the context of their time. As Richard Bower remarked, without a theory of gravity a geocentric model of the universe is the best interpretation of the available evidence. Rather than arrogantly dismissing theories of the past that have now been overturned, we should adopt a more humble attitude, motivated by the awareness that in similar ways our currently held models are only the best interpretations of the evidence available to us. Hannah Smithson’s final point related to science being an intrinsically creative endeavour. 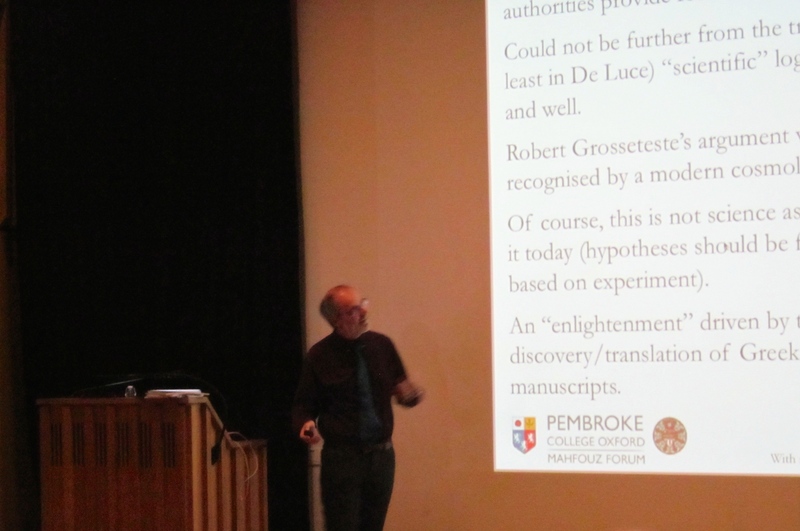 So far, the interdisciplinary Ordered Universe group has certainly made use of its creative potential, and as the collaborative readings of the De generatione sonorum last week have shown, the group is continuing on just this trajectory as it’s moving on to Grosseteste’s remaining ‘scientific’ treatises. Smithson, H. E., Anderson, P. S., Dinkova-Bruun, G., Fosbury, R. A., Gasper, G. E., Laven, P., … & Tanner, B. K. (2014). Color-coordinate system from a 13th-century account of rainbows. JOSA A, 31(4), A341-A349.